For the next few months at 5 Minutes for Books, Dawn is hosting the Children's Classics Carnival. The theme through December is reading books which have won an award (i.e., Caldecott, Newbery, etc.) I've decided to read books off our own home bookshelves to see which award winners we have. The problem is, I find myself adding to our bookshelves as we move along in this challenge! Now, we have read some Frog & Toad that we already owned but apparently a local bookclub or school group recently read Miracles on Maple Hill because I found a whole stack of them at Goodwill for $0.99 each. I couldn't, in good conscience, pass that up now, could I? So this month, I read Miracles on Maple Hill for myself. I had never heard of this book before but, in short, I LOVED it!!! The story is told from the perspective of a young girl named Maryl. The book won the Newbery in 1956 and I assume that it falls on the heels of World War II. Maryl's father was a POW who, upon release, returned to the family but is suffering from post traumatic stress disorder. Although this is not an easy topic, and is disturbing to have to think about, I thought Sorenson handled the subject matter well for younger readers. You know that Maryl's father is sad and angry and is having a difficult time readjusting to life with his family. At the same time, he is surrounded by a family - and a wife - who wants to help him. The family lives in Pittsburgh but decide to relocate to Maple Hill. 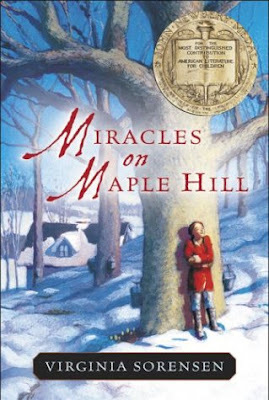 Maple Hill is a place of miracles and Maryl is certain her family will be happier there. This old farm belonged to her grandmother and Maryl has grown up hearing wonderful tales of all the lovely things that happened at this place. Sure enough, working the land is just the thing that Maryl's dad needs. Not only that, but being out of the city and being in the country seems to do the entire family a lot of good. They make friends with the Chrises, an older couple who have lived on the hill for ages and gather sap to make maple syrup. Maryl and her family learn about hard work, community and maple syrup in this fantastic story. The illustrations, by Beth and Joe Krush, take the reader right back to the 1950's and they are charming. I know the subject matter sounds fierce and certainly the post traumatic stress syndrome is what drives the family to the country. But once they are in the country, it's all about learning the land and making friends with the neighbors, learning to sing songs, tell stories and explore the great outdoors. I enjoyed this book from beginning to end and highly recommend it - unless, of course, someone you know currently IS a POW and then you might want to take a pass. I've heard of this book and I even thought maybe I had read it and just forgotten, but reading your review I'm fairly certain I've never read it. I'm adding it to my TBR list. Thanks for the review. I've never heard of this, but I love when children's books deal with real issues in a hopeful way. This sounds great, and is the kind that would grab my eye on the shelf. I've never heard of it, so thanks for spotlighting it! I'm going to pop over to Amazon for an age range... might be one my daughter would enjoy too, though we may need to wait a few years. Definitely sounds worthy of the Newbery! Thanks for sharing this thoughtful review, Carrie! That sounds like such a good book! Just the kind of children's book I'd like to read. Adding it to my TBR list! You know, I've passed this book over many times because the title just didn't grab me. Now I'll DEFNIITELY give it a second look! Thanks, Carrie! Never heard of this either, but it sounds interesting. I'm not sure I've heard of the book. My grandpa lost a leg in WWII and I heard stories of him having very vivid dreams at night. I'm sure this was common for that era. I read this aloud to my kiddos a while back (they were 8 & 10) and we all really loved it. It's one of those books that captures the magic of days gone by.